The academic and professional achievements of a 26-year-old dramatic director, a nominee and a winner of national and international outstanding festivals, are truly inspiring. Makaryan has a bachelor’s and a master’s degree from Yerevan State Institute of Theatre and Cinematography. He studied at the “Acting International” professional school in Paris and now (since September 2015) he is one of six theater directors to have been selected as a candidate for a Master of Fine Arts degree at Columbia University. He was also enrolled in the master’s program at the Paris-Sorbonne University where he conducted a research in the theater department. “My passion for classical music, acting and directing inspired me to do a research about where exactly the female performer belongs in the musical theatre,” he said. His research project at the Sorbonne is called “The theatre and the feminism” where he tries to unveil the level of a woman’s authority and her role in the theatrical environment. Makaryan said he believes that the theatre should be a thought leader as powerful as the Internet or television is nowadays. The theatre’s repertory should address current breaking issues and provide solutions for them. “As artists we are meant to observe. There are so many oppressed nations and minorities around us who don’t have the possibility to talk openly about their issues. It is our responsibility to notice and give them the space to be heard,” he said. From Paris to New York, from Stokke (Norway) to Toga (Japan), his international experiences have shaped his personality and theatrical aspirations. French, German and now also Italian are the languages that Artur has recently added to his linguistic bouquet. With every new city and every new language, he has acquired a new understanding and a new appreciation of different cultures and diversity. During his MFA theatre directing studies at Columbia University, Makaryan has staged a number of plays, including scenes from “Carmen” and “La Traviata.” Anne Bogart, a living legend and an award-winning American theatre and opera director, has been Makaryan’s greatest nurturers, saying his enthusiasm has no limits. In fact, Makaryan’s two big passions of classical music and theatre had always been battling each other for his affections until last year when he learnt about the Opera Directing Fellowship at the Juilliard School in New York. He came to realize that instead of choosing between his two talents he might as well combine them. Makaryan was one of the 1,000 applicants for the fellowship and after a very intense competitive selection, he received the fellowship at Juilliard, one of the most influential conservatories in the world and one of the major institutions of Lincoln Center for the Performing Arts. Makaryan’s love for the theatre and the stage has been accompanying him since his childhood. “I used to perform in every single performance at school. Acting on stage was helping me to get away from the reality. Acting made me powerful. Stage was the place where I could play anyone and be anyone,” he recalled. During his freshman year at the Yerevan State Institute of Theatre and Cinematography, Makaryan started engaging with various international festivals in Yerevan, Armenia. His first interactions with foreign actors, directors, and screenwriters made him feel empowered to realize that the world is much bigger, and that the opportunities are within reach. During his studies in Yerevan, he created a new musical version of “Woyzeck” with 40 actors, dancers and musicians without any budget. Just after the big success of “Woyzeck,” his colleagues and he founded a new musical theater group called Epsidon, the first theatre to perform musicals in Armenia. Armenia is Makaryan’s greatest source of inspiration and his childhood is where he goes back to find clues to his questions. He believes that living abroad and away from your memories is like being a tree without roots. He confesses to have experienced that very unnatural and uncomfortable state when you’ve lost a connection with your real self. “When you are in Armenia, you don’t have to present or prove yourself in a wider sense. But when you’re outside of Armenia, you want to be at your best in front of other nations. In that regard, we have both the talent and the tenacity to tell our story to the world. We just need to get better exposed to international experiences and feel comfortable to be part of it. We’ve lived in our own little shell for far too long,” he explained. During the summer of 2016, within the Luys Foundation’s Develop Armenia Together (DAT) program, Makaryan was in Stepanakert, Artsakh, where he directed the play “The Persians.” With the help of local actors and coordinators, he tried to convey a simple message that, in every aspect of life, diplomacy brings peace and prosperity, whereas aggression leads to a collapse. The play was a huge success. In fact, Makaryan says that as a director he found this ultimate audience in Artsakh, an audience that is so curious and so ready to be surprised. Intrigued and inspired by Makaryan’s recent visit to Artsakh, American playwright Gordon Penn sugested that he write a play after a play after doing research on Armenian history. They decided to call it “Black Garden” (Karabakh, in literally translation). It’s a love story set during the Nagorno Karabakh conflict. Makaryan is hopeful to present the full version of the play to Armenian audiences this summer and return to the US with Armenian actors to perform it at Columbia as well. 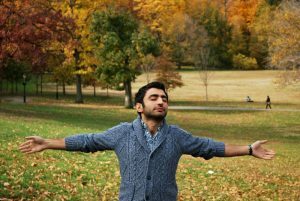 After graduating, Makaryan thinks of alternating between living in Armenia and New York. He noted that he wants to be flexible enough to direct both dramatic and musical plays. One of his biggest dreams is to direct Armenian opera pieces on international stages and also to turn the elements of Armenian dance into theatre training. He aspires to become the artistic director of the National Academic Theatre of Opera and Ballet. Makaryan gives credit to his very demanding parents for his success and the person he has become. He is also very appreciative for the Luys Foundation for development of his academic and professional life. “I deeply share the Luys Foundation mission for academic excellence. Luys has given me access to one of the best programs in my field and thus has honored me with an opportunity to present Armenia to the world,” he said. For Makaryan, being part of the Luys community means being one of the many peacemakers, healers and restorers that make not only Armenia but also the world more humane. “After collaborating with the Luys team last summer, the word ‘a problem’ has disappeared from my vocabulary and has been replaced by a more actionable one — ‘a challenge,’” he explained.